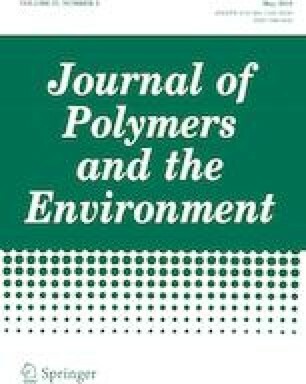 A green biocomposite was prepared from a matrix of gelatin, derived from waste seabass scale, reinforced with microfibers isolated from empty fruit bunch (EFB). The extracted gelatin (GE) had a protein content of 82.94 ± 0.3%. The EFB microfibers (M-EFB) had a diameter of 9.5 ± 2.0 µm and a cellulose content of 85.7 ± 0.6%. The effect of M-EFB contents of 0, 5, 10, 15, and 20% (w/w) on the properties of the gelatin-based films was investigated. Scanning electron microscopy (SEM) revealed the good dispersion of the M-EFB and strong interfacial adhesion between the microfibers and the matrix. This strong interaction significantly increased the mechanical strength of the gelatin-based films. Moreover, water vapor permeability, moisture content and swelling ratio were reduced and biodegradation of the films in soil was slowed down. Thermogravimetric analysis showed that the thermal stability of the biofilms was not significantly affected by M-EFB loading up to 15% (w/w). These results indicated that GE/M-EFB biocomposites fabricated from these waste by-products could provide an alternative green candidate material for packaging film. The authors are grateful for the financial support provided by Faculty of Science Research Fund (Contract Nos. 158005), Faculty of Science, Prince of Songkla University. We also acknowledge Mr. Thomas Coyne for his kind assistance in editing the English.